Locals gathered to watch, some in tears, as Pathhead Primary School burned to the ground in March 1989. 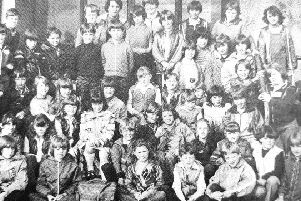 The devastating fire reduced the building in Kirkcaldy’s Cairns Street school to rubble, and left Fife’s education authority with the major problem of where to house the school’s 200 pupils. The blaze at Pathhead Primary – estimated to have caused £1 million of damage – was one of the worst fires seen in Kirkcaldy for several years. At its peak up to 50 firemen were engaged in a losing battle to save the 75-year-old building. Fife Fire and Rescue Service had received an emergency call shortly after 8.30pm on Friday, March 10 by which time the fire had established a firm grip in the school’s attic space. Fanned by a strong west wind, the flames quickly spread from the school’s west wing, and within an hour the entire south-side of the building was ablaze. Roofing collapsed into classrooms beneath, sending showers of sparks into the night air, threatening nearby houses. The school’s distinctive bell-tower crashed to the ground as walls crumbled in the intense heat. Three firemen were injured as they tried to control the outbreak, with twelve appliances drafted in from five fire stations and the operation, lasted throughout the night. Crowds of people gathered to witness the end of the original Pathhead Primary building, with some men and women openly weeping. Fife Police immediately launched an investigation, then suspiciously, just five days later, two classrooms were destroyed in a fire at Capshard Primary. The chairman of the education committee said that the coincidence was something he was “not willing to speculate upon”, but Fife’s Firemaster promised an early report with his conclusions as to the causes of both incidents. Following the fire Smeaton Residents’ Association called a crisis meeting on in response to parental concerns about temporary schooling arrangements and the long-term plans. Association secretary, Mr Ludovic Nicolosa, father of three Pathhead pupils, said: “The local community needs a school and residents feel that Pathhead must be quickly rebuilt to allow a return to normality. However, Fife’s education authority were quick to act and immediately announced that they would be considering building a replacement on the same site. The decision was welcomed by worried parents and arrangements were made for the school’s primary children to take up new classrooms at North Primary School, whilst nursery pupils were moved to Gallatown, described by the chairman as a “major logistical exercise” involving not only the pupils, but transport, materials and furniture. Senior depute education director, Mr David McNeill, said: “Teachers and staff of Pathhead Primary have been magnificent. “They have rallied round to do many things above and beyond their conditions of service. And happily the authority kept their promise – two years later in 1991 the brand new Pathhead Primary was finally opened.